The university was established in 1910 as a teacher-training school. The first classes were held in 1912 at various locations and in temporary buildings in Kent and the first buildings of the original campus opened the following year. Since then, the university has grown to include many additional baccalaureate and graduate programs of study in the arts and sciences, research opportunities, as well as over 1,000 acres (405 ha) and 119 buildings on the Kent campus. During the late 1960s and early 1970s, the university was known internationally for its student activism in opposition to U.S. involvement in the Vietnam War, due mainly to the Kent State shootings in 1970. As of September 2017[update], Kent State is one of the largest universities in Ohio with an enrollment of 39,367 students in the eight-campus system and 28,972 students at the main campus in Kent. In 2010, Kent State was ranked as one of the top 200 universities in the world by Times Higher Education. U.S. News & World Report's 2017 rankings put Kent State as tied for #188 for National Universities and tied for #101 in Top Public Schools. Kent State offers over 300 degree programs, among them 250 baccalaureate, 40 associate, 50 master's, and 23 doctoral programs of study, which include such notable programs as nursing, business, history, library science, aeronautics, journalism, fashion design and the Liquid Crystal Institute. Front of Kent Hall, built in 1915, one of the oldest buildings on campus. Kent State University was established in 1910 as an institution for training public school teachers. It was part of the Lowry Bill, which also created a sister school in Bowling Green, Ohio – now known as Bowling Green State University. It was initially known under the working name of the Ohio State Normal College At Kent, but was named Kent State Normal School in 1911 in honor of William S. Kent (son of Kent, Ohio, namesake Marvin Kent), who donated the 53 acres (21 ha) used for the original campus. As such, it is the only public university in Ohio named for an individual. [dubious – discuss] The first president was John Edward McGilvrey, who served from 1912 to 1926. McGilvrey had an ambitious vision for the school as a large university, instructing architect George F. Hammond, who designed the original campus buildings, to produce a master plan. Classes began in 1912 before any buildings had been completed at the campus in Kent. These classes were held at extension centers in 25 cities around the region. By May 1913, classes were being held on the campus in Kent with the opening of Merrill Hall. The school graduated 34 students in its first commencement on July 29, 1914. In 1915, the school was renamed Kent State Normal College due to the addition of four-year degrees. By then additional buildings had been added or were under construction. Kent State's enrollment growth was particularly notable during its summer terms. In 1924, the school's registration for summer classes was the largest of any teacher-training school in the United States. In 1929, the state of Ohio changed the name to Kent State College as it allowed the school to establish a college of arts and sciences. McGilvrey's vision for Kent was not shared by many others outside the school, particularly at the state level and at other state schools. His efforts to have the state funding formula changed created opposition, particularly from Ohio State University and its president William Oxley Thompson. This resulted in a 1923 "credit war" where Ohio State refused Kent transfer credits and spread to several other schools taking similar action. It was this development – along with several other factors – which led to the firing of McGilvrey in January 1926. McGilvrey was succeeded first by David Allen Anderson (1926–1928) and James Ozro Engleman from 1928 to 1938, though he continued to be involved with the school for several years as president emeritus and as head of alumni relations from 1934 to 1945. He was present in Columbus on May 17, 1935, when Kent native Governor Martin L. Davey signed a bill that allowed Kent State and Bowling Green to add schools of business administration and graduate programs, giving them each university status. From 1944 to 1963, the University was led by President George Bowman. During his tenure, the student senate, faculty senate and graduate council were organized. Although it had served Stark County from the 1920s, in 1946, the University's first regional campus, the Stark Campus, was established in Canton, Ohio. In the fall of 1947, Bowman appointed Oscar W. Ritchie as a full-time faculty member. Ritchie's appointment to the faculty made him the first African American to serve on the faculty at Kent State and also made him the first African American professor to serve on the faculty of any state university in Ohio. In 1977, the former Student Union, which had been built in 1949, was rededicated as Oscar Ritchie Hall in his honor. Recently renovated, Oscar Ritchie Hall currently houses the department of Pan-African Studies the Center of Pan-African Culture, the Henry Dumas Library, the Institute for African American Affairs, the Garrett Morgan Computer Lab and the African Community Theatre. The 1950s and 1960s saw continued growth in both enrollment and in the physical size of the campus. Several new dorms and academic buildings were built during this time, including the establishment of additional regional campuses in Warren (1954), Ashtabula (1957), New Philadelphia (1962), Salem (1962), Burton (1964), and East Liverpool, Ohio (1965). In 1961, grounds superintendent Larry Wooddell and Biff Staples of the Davey Tree Expert Company released ten cages of black squirrels obtained from Victoria Park in London, Ontario, Canada, onto the Kent State campus. By 1964 their estimated population was around 150 and today they have spread in and around Kent and have become unofficial mascots of both the city and university. Since 1981, the annual Black Squirrel Festival is held every fall on campus. In 1965, chemistry professor Glenn H. Brown established the Liquid Crystal Institute, a world leader in the research and development the multibillion-dollar liquid crystal industry. James Fergasen invented and patented the basic liquid crystal in the 1970s and ten liquid crystal companies have been spun off from the Institute. In 1967, Kent State became the first university to run an independent, student-operated Campus Bus Service. It was unique in that it provided jobs for students, receiving funding from student fees rather than bus fares. Campus Bus Service was the largest such operation in the country until it merged with the Portage Area Regional Transportation Authority in 2004. 1969 saw the opening of a new Memorial Stadium on the far eastern edge of campus and the closure and dismantling of the old Memorial Stadium. Kent State gained international attention on May 4, 1970, when an Ohio Army National Guard unit fired at students during an anti-war protest on campus, killing four and wounding nine. The Guard had been called into Kent after several protests in and around campus had become violent, including a riot in downtown Kent and the burning of the ROTC building. The main cause of the protests was the United States' invasion of Cambodia during the Vietnam War. The shootings caused an immediate closure of the campus with students and faculty given just 60 minutes to pack belongings. Around the country, many college campuses canceled classes or closed for fear of similar violent protests. In Kent, schools were closed and the National Guard restricted entry into the city limits, patrolling the area until May 8. With the campus closed, faculty members came up with a variety of solutions—including holding classes in their homes, at public buildings and places, via telephone, or through the mail—to allow their students to complete the term, which was only a few weeks away at the time. In 1971, the University established the Center for Peaceful Change, now known as the Center for Applied Conflict Management, as a "living memorial" to the students who had died. It offers degree programs in Peace and Conflict Studies and Conflict Resolution and is one of the earliest such programs in the United States. In response to, and protest of, the Kent State shootings, Neil Young wrote the song "Ohio" which was performed by the folk rock group Crosby, Stills, Nash & Young. Also in 1970, the university opened its 12-story library, moving from the previous home of Rockwell Hall to the tallest building in Portage County. Dedicated in 1971, the library became a member of the Association of Research Libraries in 1973. Kent State joined with the University of Akron and Youngstown State University in establishing the Northeastern Ohio Universities College of Medicine in 1973. It was the world's first medical consortium. Today it includes a college of pharmacy and Cleveland State University as an additional consortium member. Kent State was again in the national spotlight in 1977 when construction was set to begin on the Memorial Gym Annex, adjacent to the area where the Kent State shootings had occurred in 1970. Protesters organized a tent city in May, which lasted into July. Several attempts were made to block construction even after the end of the tent city, including an appeal to the United States Congress and the Department of the Interior to have the area declared a National Historic Landmark, which ended up being unsuccessful. Additional rallies were held that year, including one attended by Joan Baez on August 20. After several additional unsuccessful legal challenges, construction finally began on September 19 and was finished in 1979. In March 1991, Kent State once again made history by appointing Carol Cartwright as president of the University, the first female to hold such a position at any state university in Ohio. In 1994, Kent State was named a "Research University II" by the Carnegie Foundation. Beginning in the late 1990s, the University began a series of building renovations and construction, which included the complete renovation of the historic original campus, the construction of several new dormitories, a student recreation center, and additional academic buildings on the Kent Campus and at the regional campuses. In September 2010, the university announced its largest student body ever, with a total enrollment of 41,365. U.S. News & World Report's 2017 rankings put Kent State as tied for #188 for National Universities and tied for #101 in Top Public Schools. Kent State had a Fall 2015 acceptance rate of 85%. Kent State University is an eight-campus system in northeastern Ohio, with the main administrative center in Kent. Within the Kent State University system, the main campus is officially referred to as the "Kent Campus". The Kent Campus is a landscaped suburban environment, covering approximately 866 acres (3.5 km2) which house over 100 buildings, gardens, bike trails, and open greenery. There are also thousands of additional acres of bogs, marshes, and wildlife refuges adjacent to or near the campus. While the university's official mascot is Flash the golden eagle, the campus also has an unofficial mascot in the black squirrel, which were brought to Kent in 1961 and can be found on and around the campus. The campus is divided into North, South, and East sections but many areas have come to be referred to as Front Campus, Residential Campus, and Science Row. The main hub of activity and central point is the Student Center and Risman Plaza, which is adjacent to the twelve-story main library. The university also operated the 18-hole Kent State Golf Course until 2017, and currently operates Centennial Research Park just east of campus in Franklin Township and the 219-acre (0.9 km2) Kent State University Airport in Stow. The Ashtabula Campus was established in 1958 and is made up of four buildings: Main Hall, a library, the Bookstore Building, and the Robert S. Morrison Health and Science Building. It is on a 125-acre (51 ha) site in Ashtabula, just south of Lake Erie. The campus offers 27 associate and bachelor's degree programs of its own, with the nursing program being the largest. Approximately 75% of registered nurses working in Ashtabula County graduated with an associate degree in nursing from Kent State at Ashtabula. The East Liverpool Campus was established in 1965 from facilities formerly owned by the East Liverpool City School District, occupying a downtown site overlooking the Ohio River. It is composed of the Main Building, Memorial Auditorium, Mary Patterson Building, and a Commons area. The Geauga Campus is located on an 87-acre (35 ha) campus in Burton Township, just north of the village of Burton in Geauga County. It was established in 1964 and, as of September 2015[update], has an enrollment of approximately 2,500 students. Six associate degree and seven baccalaureate degree programs can be taken in their entirety at the campus. The Geauga Campus also administers the Regional Academic Center, a facility located in Twinsburg, Ohio. Kent State at Salem is located in Salem Township, just south of the city of Salem. The 100-acre (40 ha) campus features a lake, outdoor classroom, and nature walk. Kent State University at Salem also owns and operates the "City Center" facility in the former home of Salem Middle School and Salem High School, in which administrative offices, classes, and student services are located. The Stark Campus is the largest regional campus of Kent State University, with an enrollment of over 3,600 students, as of September 2015[update]. The campus serves around 11,000 students total each year through professional development and other academic coursework classes. It is located on 200-acre (81 ha) in Jackson Township in Stark County. The campus includes seven major buildings and a natural pond. Additionally, the Stark Campus includes the Corporate University and Conference Center, an advanced meeting, training, and events facility that is one of only ten such centers in the state of Ohio affiliated with the International Association of Conference Centers. The Center also serves as a home to the Corporate University, which provides training and learning exercises for area businesses and organizations. Kent State University at Stark offers 24 complete degree programs, including three associate degree, 18 bachelor's degree, and three master's degree programs. Kent State's Trumbull Campus is located just north of Warren in Champion Heights, Ohio, on SR 45 near the SR 5–SR 82 bypass. It offers programs in 170 majors at the freshman and sophomore level, as well as 18 certificates and 15 associate degree programs. In addition, there is upper division coursework for baccalaureate degree completion in nursing, justice studies, technology, business management, Theatre, and English, as well as general studies and psychology degrees. In 2004 the campus opened a 68,000-square-foot (6,300 m2) Technology Building that includes the Workforce Development and Continuing Studies Center. The Tuscarawas Campus in New Philadelphia, Ohio offers 19 associate degrees, six bachelor's degrees, and the Master of Technology Degree. Bachelor's degrees are offered in business management, general studies, justice studies, industrial technology, nursing and technology 2+2. The Science and Advanced Technology Center provides 50,000 square feet (5,000 m2) of laboratory and classroom space for science, nursing and workforce development. The Tuscarawas Campus has constructed a 55,000-square-foot (5,100 m2), $13.5 million Fine and Performing Arts center that will enable the campus to expand academic and cultural programming. In addition to the eight campuses in northeast Ohio, Kent State operates facilities for study-abroad programs in Florence, Italy; New York City; Cleveland, Ohio; and Shanghai, China. KSU-Florence opened its doors to International Studies Abroad in a collaboration that grants students the opportunity to study in historic Florence at its newly renovated Palazzo dei Cerchi. Palazzo dei Cerchi is a prestigious and ancient building located in the heart of Florence, at the corner of Via della Condotta and Vicolo dei Cerchi, next to the famous Piazza della Signoria and the birthplace of literary genius Dante Alighieri. Kent State acquired this facility in 2003 and undertook its complete renovation. The original exterior was maintained and reflects Florence as it was in the 13th century. The restoration carefully preserved the original structure while creating an efficient space for academic purposes, with an interior that houses state-of-the-art classrooms. The New York City Studio is located in the heart of New York City's Garment District. Surrounded by fabric and accessory shops, fashion showrooms, and designer studios; one-third of all clothing manufactured in the USA is designed and produced in this neighborhood. The District is home to America's world-renowned fashion designers, including Oscar de la Renta, Calvin Klein, Donna Karan, Liz Claiborne, and Nicole Miller. The facility is a state-of-the-art, 4,500-square-foot (420 m2) space and includes a 50-person lecture room, 12-station computer lab with instructor station, and a fashion design studio fully outfitted with professional equipment. The NYC studio gives Kent State students the advantage of working within the heart of the fashion, dance and theater industry. Kent State's Cleveland Urban Design Center is located at 1309 Euclid Ave in the downtown Cleveland Theater District neighborhood, just off of East 14th Street. The Urban Design Center was created in 1983 under the sponsorship of the Urban University Program, which supports the outreach and community service efforts of Ohio's state universities working in urban areas. Under its founding director, Foster Armstrong, the Center expanded on the existing outreach and public service activities of Kent State's architecture school, focusing primarily on historic preservation and the problems of Northeast Ohio's smaller towns and cities. In 2003, the CUDC began a collaboration with the Dresden University of Technology, Kent State's sister university in Germany, with a joint vision on the revitalization of the lower Cuyahoga Valley in Cleveland. Since then, there have been a number of faculty exchanges as the two universities seek to pool their expertise both to enhance students' experiences and to better serve their respective regions. The university has an Honors College and interdisciplinary programs in Biomedical Sciences, Financial Engineering, and Information Architecture and Knowledge Management. The College of Aeroautics and Engineering offers four aeronautics degrees; Flight Technology, Aviation Management, Air Traffic Control and Aeronautical Engineering. In 2008, the university began offering a flight training certificate program through an affiliation with Premier Flight Academy in Akron. See also: Kent State University Airport. The Shannon Rodgers and Jerry Silverman School of Fashion Design and Merchandising has programs in Florence, Hong Kong, and New York City, and affiliations in Paris and London. It was named a top-ten fashion school in the United States by Runway Magazine. The Liquid Crystal Institute, founded 1965, is engaged in the research and development of liquid crystal optoelectronic materials, technology, and consumer products in connection with the National Science Foundation as part of ALCOM. The Hugh A Glauser School of Music offers degrees in music education, music performance, music theory and composition, ethnomusicology, chamber music, and a new minor in jazz studies. The School of Music is one of the few colleges in the US that offer a BM, a MM, and a PhD in music education. The Kent/Blossom Music program partners with the Cleveland Orchestra each summer for its classical music festivals. The School Psychology Program (SPSY)  is accredited by APA and NASP. The program's graduates comprise about 18% of all SPSY professionals in Ohio. The only institution in Ohio to offer a degree in Library and Information Science, Kent is ranked 20th by U.S. News & World Report. The College of Architecture and Environmental Design programs in architecture, construction management, and interior design. Kent State has a complete undergraduate, master's, and doctoral sequence in translation and the only dual master's degree program in the nation. Faculty, staff and students collaborate at The Institute for the Study and Prevention of Violence (ISPV). The Center for Peaceful Change, a response to the Kent State shootings of 1970, was established in 1971 "as a living memorial to the events of May 4, 1970." Now known as The Center for Applied Conflict Management (CACM), it developed one of the earliest conflict resolution undergraduate degree programs in the United States. The Kent Student Center houses many of the student organizations and activities. The university offers a large number of opportunities for student involvement at all its campuses, including student and professional associations, service organizations, performing ensembles, student publications, student government, and intramural and club athletics. Greek life at Kent State is overseen by the Center for Student Involvement located in the Kent Student Center. The various organizations participate in the Panhellenic Council, which includes the Interfraternity Council and Integrated Greek Council. Sorority houses are primarily located on Fraternity Drive located across the street from the main library and fraternity houses are located throughout the city of Kent. The university set aside land for the development of a Greek fraternity village in 2008, on land near the Student Recreation and Wellness Center. Sigma Nu built a new chapter house in 2008 on this land, but is now property of the Kappa Sigma fraternity. Kent State's Greek life claims numerous famous and well-known figures in society including Lou Holtz, a brother of the Kent Delta Upsilon chapter and Drew Carey, a brother of the Kent Delta Tau Delta chapter. Through the Hugh A. Glauser School of Music and the School of Theatre and Dance, the university offers performance opportunities in the performing arts, including three concert bands (Wind Ensemble, Concert Band, and Communiversity Band), Athletic Bands (Marching Golden Flashes and Flasher Brass), three jazz ensembles (Jazz Ensemble I, Jazz Ensemble II, and Jazz Lab Band), six choral ensembles (Kent Chorus, KSU Chorale, Women's Chorus, Men's Coro Contare, Gospel Choir, and Nova Jazz Singers), one orchestra (KSU Orchestra), World Music Ensembles, as well as theater and dance opportunities. The Trumbull, Stark, and Tuscarawas campuses have theatre seasons featuring student actors. Each regional campus also offers their own performing arts opportunities. Kent State offers several student government options, the largest of which is the Undergraduate Student Government (USG), which represents students from all campuses of the university and has been in some form of operation since 1924. The current 25 person governing body was formed after the merger of the All-Campus Programming Board (ACPB) and the Undergraduate Student Senate (USS). USG is led by an executive director and is composed of eight directors, ten college senators, one senator for residence hall students, one senator for commuter and off-campus students, one senator for undergraduate studies, and 3 senators-at-large. USG oversees the USG Programming Board which hosts various concerts, comedians, and performers, as well as the USG Allocations Committee which disburses conference and programming funds to the over 250 registered student organizations on the Kent Campus. Elections for USG are held annually in March, and officers are typically inaugurated in late April. In addition to the USG, Kent State also has the Graduate Student Senate (GSS) and the Kent Interhall Council (KIC). KIC is for students who live in the on-campus residence halls and deals with policies and activities. Within the KIC is a programming board and individual councils for each residence hall. The Kent Stater, colloquially known as the "Stater", is a student newspaper publishing student and guests editorials Monday, Wednesday and Thursday during the fall and spring semesters and weekly as the Summer Kent Stater during the summer. Stater staff is entirely students, primarily in the journalism school. Most editors hold their positions for one semester. Black Squirrel Radio is Kent State's student-run radio station, which has nearly 120 students on its staff. The station streams constantly online and is also available through iTunes and on campus TV. The station plays urban, rock, and local music, and also broadcasts KSU basketball and football home games live. Fusion magazine is published twice a year by KSU students in print and on the Internet. The magazine strives to unify people of different backgrounds through education and awareness. Fusion addresses sexual minority issues within the general population using illustrative photo essays and in-depth feature articles. Uhuru Magazine is Kent State University's magazine dedicated to minority issues and topics and concentrates on African American issues and topics more specifically. Artemis Magazine is Kent State University's magazine dedicated to women's issues and topics. TV2 KSU is Kent State's student-run television station, produced solely by students with live Monday through Friday 5:30 pm news. Other student-created shows include Sports Corner; The Blurb, an entertainment news show; The Agenda, Role Call; talk shows and more, including public affairs programming and election coverage. TV2 KSU programming is available on Kent State University cable TV Channel 2.2, Portage County Time Warner Cable Channel 16 and on-demand online. HD Streaming and an online archive are available on KentWired. Eastway: Allyn, Clark, Fletcher, and Manchester. Dining halls are in Eastway, Tri-Towers, and Prentice, as well as multiple locations in the Student Center. Each of the residence hall dining locations also houses small grocery stores where students may use their board plan. 4 Paws for Ability University Program provides university students with an opportunity to foster and socialize service dogs-in-training before they begin their professional training at the 4 Paws for Ability facility in Xenia, Ohio. A chapter was founded at Kent State in August 2016 with three service dogs-in-training; it became an official organization a year later. As of August 2017[update], 4 Paws for Ability Kent State has 25 dogs on campus at a time. However, the amount of sitters, co-handlers, and volunteers is not capped. The chapter has approximately 325 volunteers on their e-mail list, about 30 sitters, and over 50 co-handlers. The organization shares custody of the small fenced-in discus area at the outdoor track along Johnston Drive. Discussion and plans began in late 2017 to create a separate field for the organization. Kent State's athletic teams are called the Golden Flashes and the school colors are shades of navy blue and gold, officially "Kent State blue" and "Kent State gold". The university sponsors 16 varsity athletic teams who compete in the National Collegiate Athletic Association (NCAA) at the Division I level with football in the Football Bowl Subdivision (FBS). Kent State is a member of the Mid-American Conference (MAC) East division and has been a member of the conference since 1951. The university athletic facilities are mainly on campus, featuring the 25,319-seat Dix Stadium and the 6,327-seat Memorial Athletic and Convocation Center, one of the oldest arenas in Division I college basketball. Through the 2014–2015 season, in MAC play, Kent State has won the Reese Cup for best men's athletic program eight times, winning in 2000, 2002, 2006, 2009, 2010, 2011, 2012, and 2013. The Flashes have also won the Jacoby Cup for best women's athletic program eight times, winning in 1989, 1996, 1997, 1999, 2004, 2005, 2010, and 2014. In 2002 the Men's Basketball team advanced to NCAA "Elite Eight", while the baseball team, women's basketball, gymnastics, men's golf, and women's golf teams have won numerous MAC titles and advanced to NCAA tournament play. Some notable athletic alumni include: Alabama Crimson Tide head football coach and five-time national champion head coach Nick Saban, former Missouri Tigers head football coach Gary Pinkel, 2003 British Open Champion and current PGA member Ben Curtis, former New York Yankees catcher Thurman Munson, Thomas Jefferson (athlete) 1984 200m Olympic bronze medalist, former Pittsburgh Steelers Professional Football Hall of Fame linebacker and four-time Super Bowl champion Jack Lambert, Pittsburgh Steelers linebacker and two-time Super Bowl champion James Harrison, ESPN Analyst and former college football national champion head coach Lou Holtz, New England Patriots Wide Receiver and Super Bowl champion Julian Edelman, San Diego Chargers All Pro tight end Antonio Gates (who played basketball at KSU, not football), former Cleveland Browns and Indianapolis Colts All Pro return specialist Joshua Cribbs, former San Diego Padres pitcher Dustin Hermanson, Tampa Bay Rays pitcher Andy Sonnanstine, Los Angeles Dodgers pitcher Matt Guerrier. pitcher Joe Crawford, New York Mets. The university operates the Kent State University Press, located in the main library building and publishes 30 to 35 titles a year. It is a member of the Association of American University Presses, which includes over 100 university-sponsored scholarly presses. The Press was established 1965 and initially published in literary criticism. In 1972 the Press's publishing program was expanded to include regional studies and ethnomusicology. Further expansion occurred beginning in 1985 when the Press began publishing works related to the American Civil War and Ohio history. Kent State counts 227,000 living alumni as of 2016[update]. It has produced a number of individuals in the entertainment industry including comedian and current Price is Right host Drew Carey, comedian and talk show host Arsenio Hall, Steve Harvey, actors John de Lancie, Michael Keaton, and Ray Wise, actresses Alaina Reed Hall and Alice Ripley, Phenomenon star Angela Funovits, boxing promoter Don King, 30 Rock producer Jeff Richmond, and That 70s Show creator Bonnie Turner. Musicians from Kent State include several members of the band Devo, which was formed at Kent State in 1973, including Mark Mothersbaugh, Bob Lewis, and Gerald Casale. Additional musicians include singers Chrissie Hynde, Jeff Timmons of 98 Degrees, Debra Byrd of American Idol, guitarist Joe Walsh, and drummer Chris Vrenna. 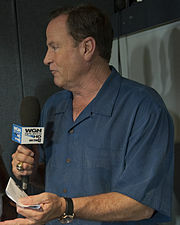 Steve Stone, Cy Young Award winner. In politics and government, several politicians in Ohio attended Kent State including former judge and United States Representative Robert E. Cook, former minority leader C.J. Prentiss, current United States House of Representatives member Betty Sutton, former representative, Lieutenant Governor, and Governor Nancy Hollister, and Supreme Court of Ohio justice Terrence O'Donnell. Other politicians include Allen Buckley of Georgia, Ohio politician Jeffrey Dean, Pennsylvania state representative Allen Kukovich, and George Petak of Wisconsin. Politician activists from Kent State include anti-war activist Alan Canfora and former Students for a Democratic Society leaders Ken Hammond and Carl Oglesby. Literary and journalism alumni include Funky Winkerbean and Crankshaft writer Tom Batiuk, Captain Underpants author Dav Pilkey, and columnists Connie Schultz and Regina Brett. Television journalism alumni include CNN anchor Carol Costello, Cleveland news anchors Ted Henry, Wayne Dawson, sportscaster Jeff Phelps, and ESPN Dream Job winner Dave Holmes. A number of professional athletes are Kent State alumni including current WWE wrestler Dolph Ziggler and National Football League players Julian Edelman, James Harrison, Josh Cribbs, Antonio Gates, and Usama Young. Former NFL players include Don Nottingham, Cedric Brown, Bob Hallen, Abdul Salaam, and Jack Lambert, along with Canadian Football League standouts Jay McNeil, Tony Martino, and Canadian Football Hall of Fame and former Kent State football head coach Jim Corrigall. College football coaches Nick Saban, Gary Pinkel, and Lou Holtz are also Kent State alumni. Major League Baseball players to come from Kent State include current players Emmanuel Burriss, Matt Guerrier, Andy Sonnanstine and Dirk Hayhurst. Past MLB players include Gene Michael, Rich Rollins, Dustin Hermanson, Steve Stone, and Thurman Munson. Additional athletic alumni include Canadian professional golfers Corey Conners , Mackenzie Hughes, Jon Mills, and Ryan Yip, American professional golfer Ben Curtis, and Olympians Betty-Jean Maycock in gymnastics and Gerald Tinker in track and field. ^ "A History of Kent State University" (PDF). Retrieved 30 March 2019. ^ a b "FlashFacts - Fall 2014" (PDF). Kent State University. November 1, 2014. Retrieved September 17, 2015. ^ "Kent State University At a Glance". Petersons.com. Petersons. December 15, 2007. Archived from the original on January 31, 2013. Retrieved September 18, 2009. ^ a b "Our Brand | Kent State University". Kent State University. Retrieved November 7, 2016. ^ "Kent State University at Kent". Carnegie Classifications. Carnegie Foundation for the Advancement of Teaching. 2014. Retrieved March 25, 2017. ^ "Fifteenth Day Enrollment Statistics". Student Enrollment Data. Kent State University. September 14, 2017. Retrieved September 14, 2017. ^ "World University Rankings 2010". Times Higher Education. 2010. Retrieved February 14, 2011. ^ "Kent State University". www.colleges.usnews.rankingsand reviews.com. U.S. News & World Report L.P. Retrieved December 18, 2016. ^ "Graduation Planning System". Kent.edu. Kent State University. September 22, 2009. Retrieved September 22, 2009. ^ Johannesen, Eric, ed. (May 30, 1975). National Register of Historic Places Inventory - Nomination Form: Ohio State Normal College At Kent. United States Department of the Interior. ^ Treichler, F. Robert. "A History of Kent Hall" (PDF). Kent State Psychology Department website. Kent State University. p. 6. Archived from the original (PDF) on June 12, 2009. Retrieved September 23, 2009. Kent State is unique among Ohio's state-supported schools in being named for an individual. ^ a b "John Edward McGilvrey, Papers, 1890-1945". Kent State University Special Collections and Archives. Kent State University. December 14, 2005. ^ Treichler, p. 1; "President McGilvery, always a visionary, harbored the prospect that Kent would one day become a great university, and he instructed George Hammond to generate an architectural master plan to reflect that goal." ^ a b c d Hildebrand, William H.; Dean H. Keller; Anita Dixon Herington (1993). A Book of Memories. Kent State University Press. pp. 18–20. ISBN 0-87338-488-1. ^ "Special Collections FAQ". Kent State University Special Collections and Archives FAQ. Kent State University. Archived from the original on May 13, 2008. Retrieved September 22, 2009. ^ Clingman, Curtis T. (September 17, 1979). "Dr. Oscar W. Ritchie". Spectrum (1998 Revision ed.). HieroGraphics Online. Retrieved September 23, 2009. ^ Elder, Melissa (February 11, 2008). "Renovations for Oscar Ritchie on Track". eInside. Kent State University. Retrieved September 23, 2009. ^ "London Black Squirrels Take Over Kent State University". Victoria-Park.com. Victoria-Park.com. 2002. Retrieved September 23, 2009. ^ Johnson, Christopher (August 1, 2005). "Liquid Crystal Institute blazes new trails at Kent State". Inside Business. Great Lakes Publishing. Archived from the original on November 2, 2012. Retrieved September 23, 2009. ...the world's No. 1 liquid crystal research center is at Kent State University: the Liquid Crystal Institute (LCI). ^ Pettypiece, Shannon (August 29, 2005). "Crystal clear; Kent State playing lead role in exploring medical, anti-bioterror uses for liquid crystal technology". Crain's Cleveland Business. Crain Communications. Archived from the original on November 22, 2008. Retrieved September 23, 2009. Since that time, the university has spun off 10 companies developing liquid crystal technology. ^ "Kent State University Campus Bus Service: History 1965-2004" (PDF). PARTAonline.org. PARTA. 2004. Archived from the original (PDF) on March 27, 2009. Retrieved September 23, 2009. ^ "Kent State Shootings". Ohio History Central. Ohio Historical Society. July 1, 2005. Retrieved September 23, 2009. ^ "Center for Applied Conflict Management". Kent.edu. Kent State University. May 15, 2008. Archived from the original on March 3, 2007. Retrieved September 23, 2009. ^ "About NEOUCOM: Universities". NEOUCOM.edu. Northeastern Ohio Universities Colleges of Medicine and Pharmacy. Archived from the original on March 17, 2009. Retrieved September 23, 2009. ^ Slobodinski, Mikhail; Schrager, Jennifer. "Tent City Chronology (Gym Annex Controversy)". Kent State University Special Collections and Archives. Kent State University. Retrieved September 23, 2009. ^ "Carol A. Cartwright". NPR.org. National Public Radio. 2009. Retrieved September 23, 2009. ^ "News Briefs". eInside. Kent State University. March 2, 2009. Retrieved September 23, 2009. ^ Fredmonsky, Matt (September 15, 2010). "KSU enrollment breaks record". Record-Courier. Retrieved September 15, 2010. ^ a b "Welcome to Kent State's Eight-Campus System". Kent State University website. Kent State University. June 11, 2008. Retrieved June 27, 2008. ^ "Ashtabula Campus Breaks Ground for a Healthier Northeast Ohio on July 17". eInside. Kent State University. July 16, 2007. Retrieved June 21, 2008. ^ "Facts & Figures". Kent State University. 2015. Retrieved October 21, 2015. ^ "About Us". Kent State University. 2015. Retrieved October 21, 2015. ^ "Star County's Conference Center". Kent State University. 2015. Retrieved October 21, 2015. ^ "Facts & Figures". Kent State University. Retrieved October 21, 2015. ^ "Kent State University in Florence". studiesabroad.com. International Studies Abroad Inc. Retrieved July 12, 2008. ^ "Kent State Meets the Big Apple: NYC Studio Announces Official Opening October 11". einside. Kent State University. October 9, 2006. Retrieved July 12, 2008. ^ "Cleveland Urban Design Collaborative". CUDC. Kent State University. Archived from the original on May 9, 2008. Retrieved July 12, 2008. ^ "Kent State and Premier Flight Academy Launch Innovative Flight Training Certificate Program". Kent State University. Retrieved October 8, 2009. ^ "International Student Program". Premier Flight Academy. Archived from the original on March 24, 2009. Retrieved October 8, 2009. ^ Rogers, Emily (October 11, 2009). "Top 10 Fashion Schools". Runway Magazine. Archived from the original on January 30, 2010. Retrieved January 14, 2010. ^ "Library and Information Studies". US News & World Report. 2009. Archived from the original on January 1, 2010. Retrieved January 14, 2010. ^ "Board Establishes Nation's First Dual Master's Degree Program in Language Translation". www.kent.edu. Kent State University. Retrieved June 25, 2008. ^ "CACM Homepage". March 3, 2007. Archived from the original on March 3, 2007. ^ "Kentnewsnet.com". Archived from the original on February 23, 2009. Retrieved July 8, 2009. ^ "Performing Arts Center | Kent State University". www.kent.edu. Retrieved January 15, 2018. ^ "About the Undergraduate Student Government of Kent State University". Kent State Undergraduate Student Government. 2018. Retrieved January 21, 2018. ^ "Kent Interhall Council: About Us". Kent State University. 2018. Retrieved January 21, 2018. ^ "4 Paws for Ability Kent State". 4 Paws for Ability. Archived from the original on September 25, 2018. Retrieved January 8, 2018. ^ "Kent State Captures Eighth Jacoby Trophy". Kent State University. May 20, 2014. Retrieved June 15, 2015. ^ "About Us". Kent State University Press. 2017. Retrieved February 26, 2017. ^ "Facts & Figures". Kent State University. Retrieved June 21, 2016. ^ Biliczky, Carol (March 27, 2012). "Kent State unveils mural by Funky Winkerbean creators". Akron Beacon Journal. Akron, OH. Retrieved March 28, 2012. ^ "Dav Pilkey Author Profile | Biography And Bibliography | NewReleaseToday". www.newreleasetoday.com. Retrieved February 26, 2017. ^ "Emmanuel Burriss Stats | Baseball-Reference.com". Baseball-Reference.com. Retrieved February 26, 2017. Hildebrand, William H.; Dean H. Keller; Anita Dixon Herington (1993). A Book of Memories: Kent State University, 1910-1992. Kent State University Press. ISBN 0-87338-488-1. Hildebrand, William H. (2009). A most noble enterprise: the story of Kent State University, 1910-2010. Kent State University Press. ISBN 1-60635-030-7. Wikimedia Commons has media related to Kent State University.